Supercharged performance for the street is now available in the Honda CR-Z Sport Hybrid Coupe through a new dealer-installed Honda Performance Development (HPD) supercharger kit. Best known as Honda’s North American racing company, HPD developed a full line of street performance accessories for the CR-Z and first revealed them at the 2013 SEMA Show. With the debut of the supercharger kit this month, all of the HPD street performance components for the CR-Z are now available at Honda dealers in the United States. 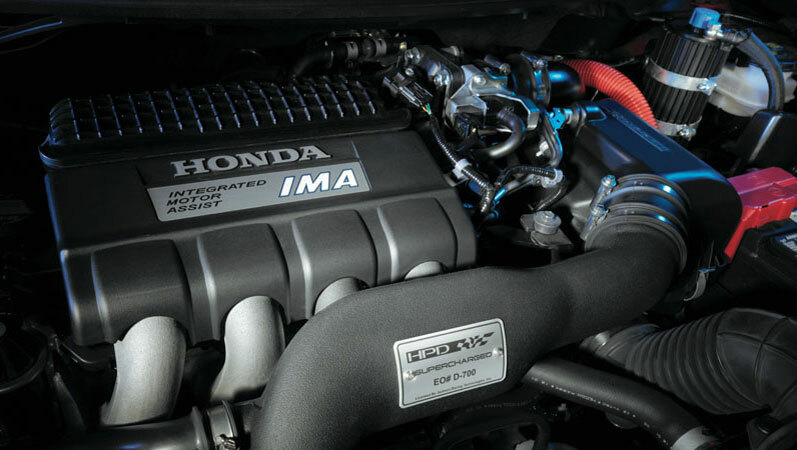 Available for the 2013 and 2014 CR-Z, the HPD supercharger kit boosts total powertrain output to 197 hp1 (vs. 130 hp in the stock 2013 and 2014 CR-Z with manual transmission) and includes the HPD air-to-air intercooler, high-flow fuel injectors, an ECU calibrated to meet CARB AT-PZEV regulations with 91 octane fuel and the HPD air filter system. Honda’s Suggested Retail Price of the kit is $5,495, not including dealer installation, which is priced similarly to popular aftermarket supercharger kits but is engineered and backed by Honda. The HPD supercharger kit maintains the balance of customer’s 5 year/ 60,000 mile Honda limited powertrain warranty when installed by a Honda dealer. The HPD supercharger kit is available exclusively for CR-Z manual transmission models and HPD has developed an optional limited slip differential and HPD sport clutch for those customers looking for an even higher level of performance.